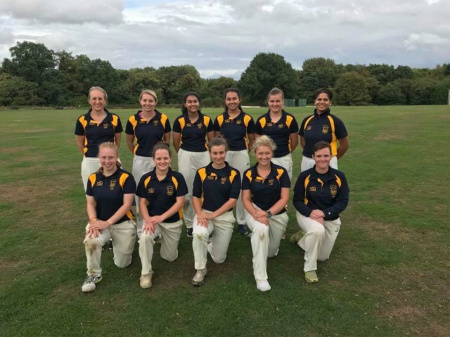 The season began with a convincing win against Burton Latimer, with Sarah Clarke and Tammy Mattison scoring 44 and 40 respectively to reach 199 all out. Pick of the bowling was Laura Crofts with 3-19 off 6, with Horton House all out for 140. Following on were a succession of back to back wins against Burton Latimer, Lutterworth and Clifton, some being very tight and showing the depth of both bowling and batting from the Oxford Ladies. Both the senior players and the youth contributed important innings and bowling spells throughout the season, on occasion under lots of pressure. The season ended with a match against Lutterworth. Despite Lutterworth's strong opening batter, L. Crofts bowled a fantastic yorker to end her innings and following good bowling and two spectacular catches from Charlotte Hayes Lutterworth were soon all out for 121. S. Clarke and L. Crofts contributed 29 and 26 respectively with C. Hayes making an important 18 to see Oxford through as unbeaten league champions. This is a remarkable achievement which highlights a decade of hard work from the Women's and Girl's section, coaches and players and reflects how much progress the club has made. Oxfordshire Cricket would like to take this opportunity to congratulate Oxford CC Women's 1st XI on this amazing achievement.